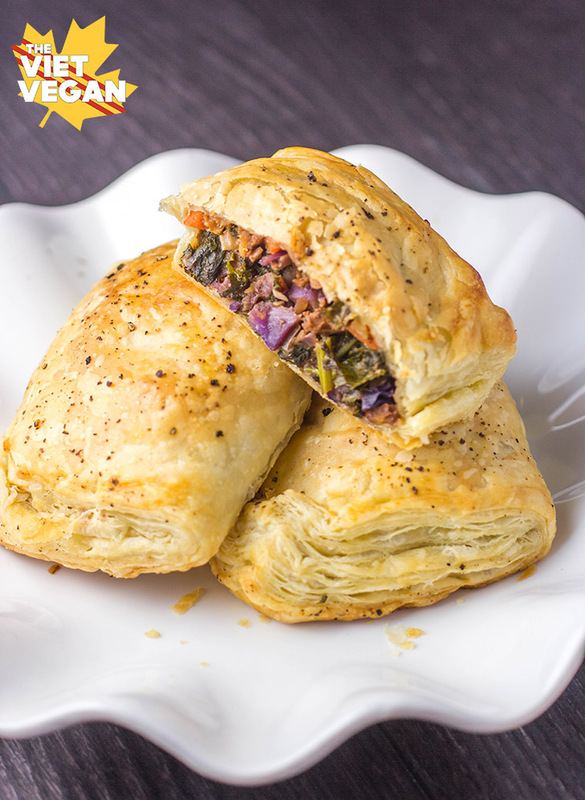 Into a delicious savoury vegan sausage puff pastry? It’s been so gross outside lately even though it’s supposed to be spring, so I find myself reaching again for comfort foods instead of the bright and vibrant spring produce that would be popping up otherwise. Root vegetables, hearty greens, members of the brassica family and crisp, buttery things. My body is ready for sunshine and warm weather and my skin has had enough of this dry, gross flip-flopping of temperature. I have been experimenting with more vegan and cruelty-free makeup, which is new and exciting. Growing up, I loathed makeup. I was traumatized by my first experience with my mom, who on my 7th birthday, nearly pinned me down to apply eyeliner for birthday photos. I particularly remember being teary eyed and upset when my friends showed up for my birthday party. But I did get some Spice Girls pens and a signed (albiet printed) poster of all the Spice Girls which I think I had up until I helped my parents clean out my old room, in which the frame broke and tore the poster. SO MUCH SORROW. I started wearing eyeliner on my own in high school when I went through a sort of punk-rock phase and I was self-conscious that my eyes were tiny, but I had no idea what I was doing, even though one of my best friends was basically a beauty guru by the time she was 14. Now she’s an aesthetician so it all makes sense. I remember her eyebrow game was always so good, even when we were kids. Every time I see her, I get a little bit better and better at makeup. But for the most part, I could only do one thing: a cat-eye with eye-liner to compensate for one of my eyes being bigger than the other, thanks to having one monolid and one double-lid. I started playing around with makeup a little bit more starting about two years ago—meaning it’s taken me TWO years to finally muster the patience to master my eyebrows. The game changer was when I figured out I could wet the eyebrow brush to apply my powder once my pencil had run out. Now I just use the powder and the brush, no need for the expensive pencil. But now I’ve figured out foundation, bronzer, blush, and I’ve even experimented a tiny bit with smokey eye, although it sometimes is a little bit intense for me, so there are days where I just stick to my classic cat-eye and some filled-in brows. I’m by no means a beauty guru, but I think I might start doing videos where I talk about make-up. I’ll still keep my channel mostly about food, but I know it can be hard to find cruelty-free and vegan products to fit Asian features, because Asia gives nearly zero cares about animal welfare, and most cosmetics here are geared towards Caucasian complexions. In a small bowl, combine flax meal and warm water. Stir and let sit to thicken while you prepare the rest of the ingredients. Preheat your pan over medium heat. Add oil and onion and cook until the onions are translucent. Add garlic and stir to cook for about a minute or two (until fragrant). To the pan, add celery and carrot. Use a tbsp or two of water to get things going. Cook until carrot is heated through with just a tiny bit of crunch to it, about 4-5 minutes. Deglaze the pan with a hearty glug of white wine (I probably used about 1/4 cup) and stir to cook it off. Add banana pepper and purple cabbage and cook until those are heated through, about 3-4 minutes. Stir in diced vegan sausage, onion powder, garlic powder, cumin and chili powder for about 2-3 minutes until everything is heated through. Add chopped kale and another few tbsps of white wine (or water) to steam up the kale. Once barely wilted, finally add in the spinach. Turn off the heat and stir to combine everything (the remaining heat should wilt the spinach). Transfer to a separate mixing bowl (to stop the mixture from cooking) and stir in the prepared flax egg. Set aside. Pull out your thawed puff pastry and roll it out about 1/8 inch thick on a well-floured surface. Cut into 6 pieces. Fill each piece with about 1/3-1/2 cup of filling and pinch the edges closed. I crimped mine but that pretty much did absolutely nothing as you saw in the video, so you can take a knife and gently run it along the edges of the filling (maybe about 1/2 inch from the edge) to separate a "crust" for the pastry. Use a baster to paint some aquafaba over the top and over the edges well to ensure a golden browning and prevent it from burning. Garnish each pastry with a couple turns of freshly ground black pepper, then bake for 25-30 minutes, rotating halfway through. Remove from oven and let cool on a wire rack. Serve immediately! Leftovers can be stored in the fridge once cooled completely, then reheated either in a toaster oven or in the microwave, but it'll be crispier in the toaster oven. I had leftover filling, which is great over rice or quinoa, and good as a side dish (or main, actually). Lisa (and anyone else), Please tell me what brand of vegan puff pastry you use, and do you order it online or pick it up at your local store? Thanks!